Success for your business requires constant visibility on desktop and mobile search, through e-mail & lead generation, social media, and everyday web browsing. At Mpower Web Solutions, our “hybrid” approach to digital marketing and web design ensures you stay engaged with current and new customers through all “touch points”. Power on & Turn it Up! We specialize in WordPress web design, custom themes & front-end development, and utilizing various responsive resources to help expedite set up & training time on your website/online store. From customer-facing content development to front-end (UI/UX) design, we work with you to ensure your marketing is on point. In 2018, 65% of digital consumption was on mobile devices, while desktops/laptops were a “secondary touch point” for e-commerce/entertainment. Our “multi-platform + responsive” approach optimizes your digital marketing and overall “web presence” to maximize customer reach and engagement to grow your business. A dedicated project manager will first assess your marketing & website needs, then recommend solutions and strategies to overcome “pain points” to help you achieve your goals. You will receive constant updates (by e-mail or phone) as your website/online store/online marketing project progresses. Top-ranking search results and visibility is a primary concern these days. We employ the latest strategies to help position your website in front of your target customer. We also utilize search engine optimized WordPress software to develop content, while also managing the “web presence” for your growing business. Whoa! Don't Miss Your FREE Smart Business Check-Up! Give us 1 minute of your time and we’ll prepare a FREE SMART BUSINESS CHECK-UP by e-mail, or schedule a free 30-minute consultation. Yes! I want to know more! Answers to questions concerning online marketing and website design to empower entrepreneurs, solopreneurs and small/mid-sized corporations. How can I improve my Social Media Marketing? Set up social media contests and promotions with call-to-action (i.e. contests, coupon codes/exclusive discounts) to drive engagement and online conversion (i.e. request for quote, direct purchase, etc.). E-Commerce store integration with Facebook (if the online store is available). Prepare reports using Facebook Page Insights and Google Analytics based on page activity and engagement. Does Mpower Web Solutions support automated e-mail marketing? Import e-mail contact list(s) from contact database, or export contacts from existing Excel, Gmail, Outlook. Prepare e-mail content (images, links, text) based on client feedback and approval. Digital assets may require legal compliance per e-mail provider terms. Schedule distribution date — May be necessary to coordinate e-mail marketing with planned product launches or trade show attendance. Provide e-mail campaign report and recommendations for improving responses and conversions. Train staff on the use of e-mail marketing software — Entering new e-mail contacts, coupon codes, sales leads, converting to customers, post-sale follow up. What is CRM? Do I really need to be using it? CRM Marketing systems are NOT just for Fortune 500 corporations these days. CRM (Customer Relationship Management) is actually a valuable resource for small to mid-sized businesses (SMBs) needing an efficient, cost-effective tool to support cross-channel marketing efforts. These online systems essentially track clicks and responses, generate sales leads, and determine which coupon/discount codes are working on specific campaigns. Mpower Web Solutions provides access to affordable “cloud-based” services for creating, tracking and measuring campaign activities and goals over multiple “touch points” for engaging with current and new customers. What's all this "responsive web design" stuff? A “responsive” web site is designed with a “mobile-first” method to ensure your business can be found by potential and current customers. According to a 2018 marketing research report by StatCounter, mobile device use for online searches is 90% (95% on Google’s mobile browser). Google is also rewarding “mobile-first” websites with higher ranking opportunities. Be RESPONSIVE, not REACTIVE with your web presence and digital marketing. From small startups needing to establish a footprint on major search engines (i.e. Bing/Google/Yahoo) and social media, to full e-commerce-enabled websites, Mpower Web Solutions will work directly with you to design a website to meet your “web presence” efforts and budget. Go/G0+ packages are a good starting point. Power/Power+ offer bloggers/large websites a content-rich, customizable, value-added solution with e-mail lead form(s) and SEO setup. We work with reputable, well-known e-commerce carts, payment gateways, and service providers including Authorize.Net, BigCommerce, Easy Digital Downloads, Etsy Shop, Event Tickets Pro, FirstData, PayPal Payments, Shopify, Stripe Payments, Volusion E-Commerce, and WooCommerce (e-commerce plugin for WordPress). E-Commerce pricing is dependent on # of products (physical inventory, virtual products/services) and desired cart/store features. Build credibility & visibility for your business. NEW CLIENT BONUS! FREE GoDaddy WordPress Web Hosting (first year paid by Mpower Web Solutions – $100 value). Don’t have a current website hosting service provider? Ask about discount web hosting for new clients. We work with various reputable hosting providers including 1&1, BlueHost, GoDaddy, Network Solutions, SiteGround, TDM Hosting, Web.com, and many others. Hosting cost not included in the above packages unless indicated. PRICING SHOWN ON THIS PAGE IS FOR “DESIGN AND SET UP SERVICES ONLY”. ADDITIONAL CHARGES APPLIED TO THE PROJECT TOTAL FOR INVOICING OR DIRECT PAYMENT TO THIRD-PARTY VENDORS MAY INCLUDE THE FOLLOWING: BUSINESS PRODUCTIVITY SOFTWARE, CRM/CMS, DOMAIN REGISTRATION/RENEWAL/ TRANSFER, E-COMMERCE SHOPPING CART/STOREFRONT SERVICE PROVIDERS, E-MAIL AUTOMATION/MARKETING SERVICE PROVIDERS, MERCHANT ACCOUNT/PAYMENT GATEWAY, SSL CERTIFICATE, TEMPLATE/THEME DEVELOPER LICENSING FEES, WEBSITE HOSTING SERVICES, OTHERS TBD BY PROJECT TYPE. THIRD-PARTY CHARGES TO BE ESTIMATED DURING PROJECT ASSESSMENT AND QUOTE FOR DISCUSSION. 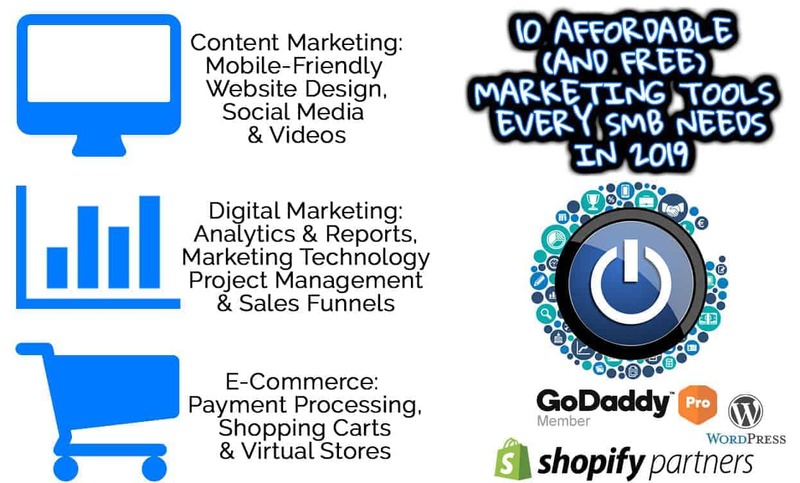 We support the day-to-day digital marketing needs of small and growing businesses looking to connect to and stay engaged with current and new customers through Blogs, CRM, Content & Email Automation, Sales Funneling, Social Media Marketing & PPC Campaign Management. Power on and turn up your marketing today! Live and streaming videos complement the content marketing efforts for just about any type of business. Our recent clients include an author releasing a book on Amazon, an interior office design firm showing off their latest client project, or even a personal concierge business announcing their new digital magazine. knowledge of PPC/SEM (Paid Search – Google AdWords) & SEO (non-paid, content-driven search results). Campaign set up, methods to improve clicks, conversions, and ROI. Need an experienced Webmaster to help maintain your website and hosting services? We work with several of the well-known domain, e-mail, and WordPress website hosting providers including 1&1, BlueHost, GoDaddy (Pro Member status), Network Solutions, Register.com, Web.com, and many others. Contact Mpower Web Solutions Today! Have a question about our content management, digital marketing, and web design & maintenance services for your business? © Copyright 2010-2019, Mpower Web Solutions | All rights reserved. Best time to contact you for an initial consultation? How did you hear about Mpower Web Solutions? The following questions are optional. Information provided will help our staff assess your specific needs prior to your consultation. Do you currently have an active website? What is the site address? List any registered or parked domains you own and want to use for your web project. What domain(s) is/are preferred for any new website(s)? Please provide desired domain (yourdomain.com/.net/.org./us or other). Only 1 per line in this text box. Do you sell your products/services to other businesses (B2B) or directly to your customers (B2C)? Perhaps some of both? Will you need e-commerce (i.e. shopping cart, online store management, payment processing, shipping & package tracking)? Business & Marketing Plans, Business Productivity Solutions, Bing/Google PPC/SEM, SEO, Social Media Marketing, just to name a few. Chad Heintz at Mpower Web Solutions has been and continues to be a great partner in the building, maintaining and innovating my website and all of the different divisions of my company. I HIGHLY recommend Chad for your web and marketing projects. He will take great care to give you the product that you desire! Take our quick "1-minute" ranking survey (1-10) for your smart business check-up. Yes! I Want My Free Check-Up! Online survey link redirected after sign-up. Your e-mail will be used for follow up purposes. Mpower Web Solutions will connect with you for a FREE 30-MINUTE ASSESSMENT. Let's "Power On & Turn it Up" for 2019...and beyond! Chad Heintz at Mpower Web Solutions has been and continues to be a great partner in the building, maintaining and innovating my website and all of the different divisions of my company. I HIGHLY recommend Chad for your web and marketing projects. He will take great care to give you the product that you desire!